Finland’s new Strategy for the Arctic Region defines a number of objectives for Finland’s Arctic policy and explores ways of promoting them. The strategy addresses local residents, education, research, the economy, infrastructure, the environment, stability and international cooperation in the Arctic. 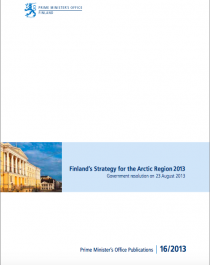 Underlying the review of Finland’s Strategy for the Arctic Region is the increased significance of the region and a growing perception of the whole of Finland as an Arctic country. Finland possesses diversified Arctic expertise and it is very much in its interests to be involved in the development of the region. The new strategy is a reflection of the drive to pursue these ambitions. The Government Programme of Prime Minister Jyrki Katainen’s government, announced on 22 June 2011, makes reference to the Arctic strategy by foreseeing intensified efforts to implement it. The previous strategy announced in 2010 focused on external relations. The new strategy addresses a wide range of issues. It examines the possibilities for bolstering Finland’s position regarding the Arctic region; the creation of new business opportunities; the Arctic environment and the region’s security and stability; the position of the northern parts of Finland; international cooperation; and Arctic expertise in the widest sense of the term. Finland’s Arctic policies were adopted by the government in its evening session held on 10 October 2012. Inherent in the perspectives created by the new strategy are the four pillars of policy outlined by the Government: an Arctic country, Arctic expertise, Sustainable development and environmental considerations and International cooperation. Together, these elements define Finland’s role in the Arctic region. It is Finland’s objective to promote growth and actions to enhance competitiveness in the region with due regard to the local environment. The strategic review was prepared by a working group appointed by the Prime Minister on 31 October 2012, in which all the ministries were represented. This network of designated civil servants involved in the task was chaired by Ambassador Hannu Halinen. Work on the strategy was overseen by the permanent secretaries of the key ministries under the supervision of State Secretary Olli-Pekka Heinonen. Additional support for the efforts was provided by the Arctic Working Group appointed by the government and chaired by State Secretary Heinonen.